A few weeks ago we painted our living room, transforming it from a sickly green to a vivid, dark green, by way of a pale yellow. What can I say—we bought cheap paint from a cheap paint store and it didn’t cover our walls. After we were done painting, I washed the paint rollers in our outdoor sink. 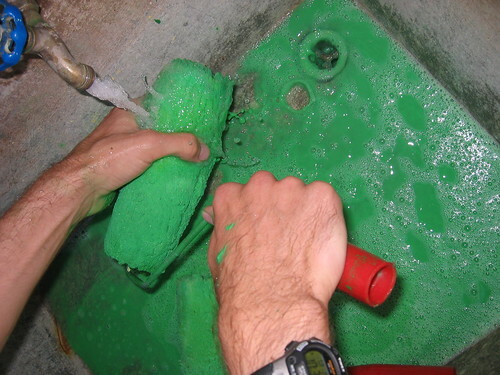 I washed and washed, but green paint still flowed from the rollers. As I watched the green water flow through the sink, I had visions of the dyed-green river running in Chicago on St. Patty’s. Hopefully you think the same since I’m offering this photo as my online celebration of March 17 this year. Sláinte!